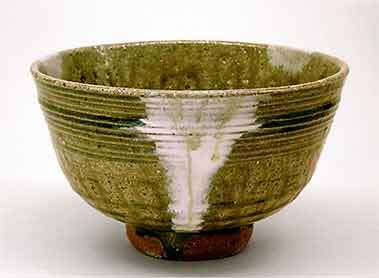 Bill Marshall bowl - 7½" (190 mm) diameter, 4⅜" (111 mm) high. 1999. In August 1938 at the age of 14 William Marshall became Bernard Leach's first apprentice. To his classmates at school the ideal was to get a job at the Co-op or the International Stores, but Bill knew he wanted to be a potter. There were only ever three apprentices at the Leach Pottery, and all three from the same family. At 18 Bill was called away to serve his country in the Second World War, but apart from that interval stayed with the Leach for nearly forty years and became Bernard's right-hand man. He feels that the relationship between apprentice and master is more like that of child and parent than student and teacher; the learning process being a matter of absorption rather than of instruction. Bill is a consummate thrower, and was able to pick up on Bernard's ideas quickly and accurately. In Bernard's later years when he hadn't the strength to wield large lumps of clay, Bill did his throwing for him, leaving Bernard to apply the decoration and the finishing touches. In 1977 he set up his own workshop at Lelant, a stone's throw from St Ives, and still pots there. His output is not prolific now, only supplying enough work for a firing every eighteen months or so, in which he is assisted by his son, Andrew Marshall, and his nephew, Scott Marshall. One of Bill's greatest annoyances is being called and asked "Have you done it yet?" He likes to have time to take stock of the successes and failures after unpacking the kiln, and for this reason firing dates are kept a closely guarded secret. Bill is a modest man, fired with the same enthusiasm he had when he first joined the Leach Pottery. He still goes to bed at night thinking about pots he has yet to make.